The desert moon in the Jedha system began as a pilgrimage spot for believers of the Force, and then the Empire rolled in. Jyn Erso and her Rebel friends in Rogue One: A Star Wars Story will be spending a lot of time dodging through the dilapidated streets of a holy city on the surface of Jedha. The aptly-named Jedha (sounds a little like “Jedi”) isn’t actually a planet, it’s a desert moon in the Jedha system, which is probably found in the Star Wars galaxy’s Inner Rim. It might be cold and the streets might be war-torn, but the moon’s spiritual history makes it one of the most interesting locations in the entire Star Wars franchise. While the exact location of the planet might not be made clear in Rogue One, there does seem to be some discrepancy as to exactly where Jedha is located in the galaxy. 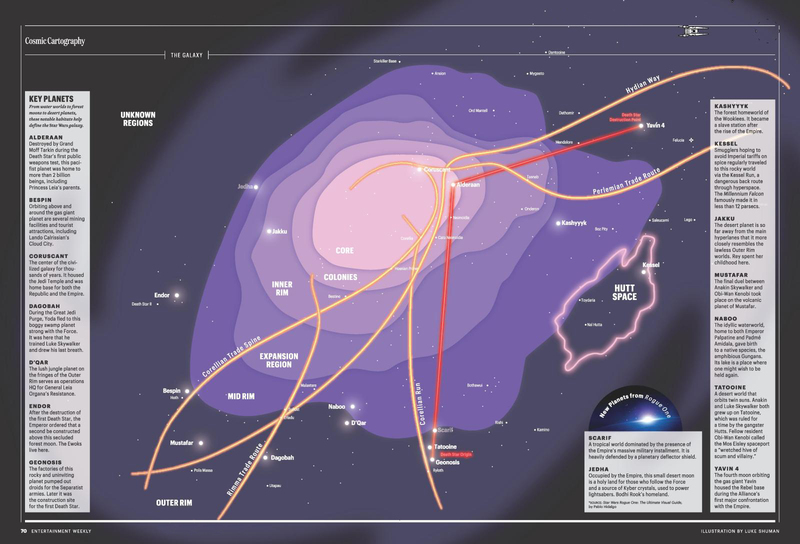 Wookieepedia says the system is in the “Inner Rim,” which would mean it was one of the first locations of galactic expansion from the original Colonies. This would put the planet within spitting distance of Coruscant. But, a map released in a special Entertainment Weekly guide to Rogue One makes it look like Jedha is way the hell out there, and definitely not in the Inner Rim. Presumably, Wookieepedia got its Inner Rim detail from the forthcoming book Star Wars: Galactic Atlas. But if EW made their map with the cooperation of the Rogue One production team, then maybe Jedha is in the Outer Rim, not the Inner? Notice, Jedha is all the way up in the left-hand corner here. Regardless of exact place in the galaxy, Jedha has been around for a while. In fact, in ancient times, Jedha was home to one of the first civilizations to explore the nature of the Force. You know the Force, the all-encompassing field of energy that binds the universe together and is the source of power for the Jedi. Some scholars in the Star Wars galaxy make an argument for Jedha being home to the first temple of the Jedi Order in existence, which would only legitimize Jedha’s importance even more so. Also, recall, Han mentions Luke might have been “looking for the first Jedi temple” in The Force Awakens. Because of Jedha’s history, it has become a place of great meaning for people who follow the ways of the Force — Jedi and non-Jedi alike. Jedha acts as a holy land, a place of pilgrimage. Then, the Empire arrived. The Galactic Empire occupied Jedha after the fall of the Jedi Order and the Galactic Republic. Their presence on the home planet (or, in this case, home moon) of so many Rogue One characters had everything to do with the planet’s large store of kyber crystals. The crystals are a key component in making lightsabers — and to power the Empire’s most feared superweapon: the Death Star. The oppressive Imperial presence soon inspired the rise of a Jedha-based resistance. Jedha was also home to Rogue One characters such as the Imperial-turned-Rebel pilot Bodhi Rook, warrior monk Chirrut Îmwe, and freelance assassin Baze Malbus. And Saw Gerrera leader of Rebel extremists, the Partisans — held down a bunker, a hidden base, on the moon. All would soon team up with the Rebel Alliance to steal the plans to the Death Star. Hence, the entire plot of Rogue One. Scenes for the upcoming movie were filmed on location in the Middle Eastern country of Jordan, which provides the moon with its desert climate. Jordan’s characteristic heat probably wasn’t conducive to the Rogue One actors pretending they were in a frigid desert, but an environment like is rare enough on planet Earth. Jedha will appear for the first time onscreen when Rogue One: A Star Wars Story premieres on December 16.